Everyone wants to know that their voice is heard, that their opinions and feelings matter. This is seen in the workplace, at home, and at school. But how can a busy music teacher find time to listen to ideas and input from every student who has something to share? You can’t do this in the classroom effectively, so I am adjusting something my middle school band director did that I thought was great: the music suggestion box. I am changing mine to be a “Note Box”, in which students can leave notes to me about nearly anything. They can suggest music, tell me about something that they like, share something that they wish could be done differently, or simply inform me about something that is important to them that they might not feel comfortable talking about in person. Hopefully this will be a useful tool in the classroom! You could even do variations of this by having different classes make a box for each class, or for an elementary classroom students could make personalized boxes (or some mail receptacle) for others (including teacher) to put notes into. Students can feel their voice is heard and appreciated. This cuts down from class discussion and student dissension. Students will not take time to write down something unimportant. Students will have a safe way to make needs known, or to report something. 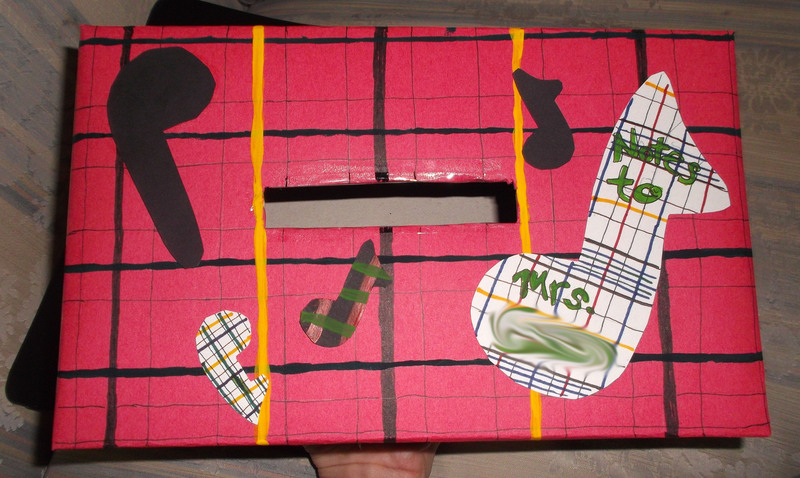 Materials: shoe box, ruler, construction paper, tape, glue stick, pencil, felt-tip markers, paint and brush (could use gel pens or paint pens too), scissors, and music note cookie cutters which I used as stencils. This entry was posted in Classroom Management and tagged box, craft, creativity, criticism, decision, direction, feedback, ideas, management, music, students, suggestion, time. Bookmark the permalink.